Inspirational people who are down-to-earth are certainly a lot more desirable than those who brag about their accomplishments and achievements. Humble people haven’t forgotten where they came from. They know how to look back. They remember. One of them is Muay Thai superstar Buakaw Banchamek, a former K-1 world MAX champion. Unlike other public figures who go to social media to post their party photos and selfies so as to gain likes and followers, Buakaw decided to share to his fans photos on how he still live his life whenever he’s in his hometown of Surin. 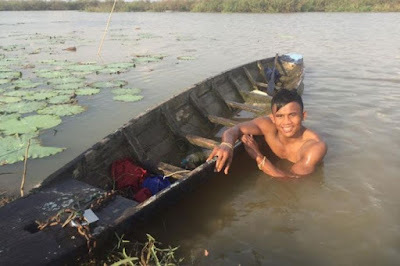 This popular Muay Thai fighter was seen swimming in a canal and catching shrimp for dinner. “It’s afternoon and you gotta jump into the pond!” a caption in one of the photos said. Netizens admire Buakaw for being down-to-earth despite being famous and not letting his fame corrupt his lifestyle and the way he thinks. “I just like this man. Time changed, but he never changed. He was down to earth then and he is now. Despite anyone saying he’s only putting on an act for the public, I love Buakaw for being just who he is,” one of the top rated comments said. “I like that he’s a talented Muay Thai fighter, but more than that I like Buakaw for being himself… and never forgetting where he comes from,” another user added.